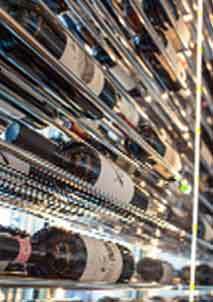 Wine collectors in Texas want the best wine storage solution to keep their investment safe. When it comes to storing wine and allowing it to age properly, there is no better place than a custom wine cellar with an efficient wine cellar cooling unit installed. Learn about an effective wine storage solution built in Texas by Wine Cellar Specialists and US Cellar Systems. Wines are an investment that needs to be protected. To protect them, you need to store them in the ideal conditions. These conditions are adequately met in a residential custom wine cellar that has a wine cellar refrigeration unit installed. Two of the most trusted companies when it comes to building wine storage solutions in Texas are Wine Cellar Specialists and US Cellar Systems. There are many wine cellar designer and builders in Texas, and Wine Cellar Specialists is one of the most trusted. Wine Cellar Spec has a good reputation of building beautiful, durable and functional wine cellars, whether for residential or commercial purposes. They are well-known for delivering customer satisfaction, because they always make sure that their designs meet their clients’ storage needs, style preferences, and budget. Wine Cellar Spec offers consultation services for their clients on an individual basis, and their consultants are willing to work alongside their clients from the design phase of a wine storage project up to its completion. There are many types and brands of wine cellar cooling units on the market, but not all of them are efficient and suitable for your custom wine cellar. Each wine cellar has different storage requirements, and therefore, each one needs a different kind of wine cellar cooling unit. US Cellar Systems is one of the most trusted wine cellar cooling systems manufacturers in Texas because, not only do they provide quality cooling units, but also provide a wide array of options, so that you can choose the right unit that can appropriately meet your wine storage needs. US Cellar Systems also offers installation and maintenance services. 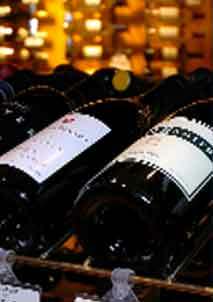 Wine Cellar Specialists can build custom wine racks to meet the storage needs of any wine cellar. In this particular wine cellar, Wine Cellar Spec built racks that were customized to fit the unconventional curved walls of the closet room. For aesthetic appeal, the wine rack designers made the racking look seamless by minimizing the use of joints and screw holes. Mahogany was the wood of choice for the racking, and a rustic stain and lacquer was applied to enhance its beauty. Lattice horizontal display racks were built and installed along the straight walls of the room. They are connected by a mini quarter round wine rack to the center area of individual 750 bottles slots, with a display reveal row with a true radius curve. The wine racks end at the lower end, with a horizontal rack that tops off a lattice X bin, with lattice case storage at the bottom. When building a custom wine cellar, one of the things that should be given importance is the wine cellar flooring. The flooring plays an important role in keeping the temperature and humidity in the wine storage room constant. Also, its design contributes greatly to the overall appearance of the wine cellar. There are many kinds of materials that can be used for wine cellar flooring. One of the most popular kinds is reclaimed wine barrel. Reclaimed wine barrels have 3 basic parts: stave, infusion, and cooperage. The stave refers to the sides of the barrels. This part has indentations caused by the metal hoops that used to be attached to them. The infusion refers to the inside of the barrels, that have been stained by the wines that used to be stored in them. The cooperage, which is the part used for this particular wine cellar project’s flooring, refers to the wine barrel heads, where the original stamps and markings are printed. These stamps and markings added character to the overall wine cellar design. The flooring is the feature that the client loved most in the cellar. A wine cellar door is not only an entry way to the wine storage room. It is also essential for keeping the room secure and keeping the temperature and humidity stable. Also, it adds beauty the overall design of the wine cellar. 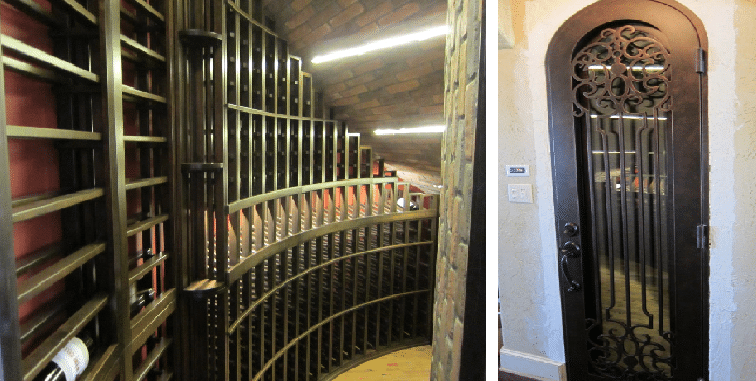 For this wine cellar project in Texas, the wine cellar builders made a purpose-built wrought iron wine cellar door. The door also had operable glass, so that the client can easily clean and maintain it. Moreover, a Venetian View design was included with copper mist color and an oil-rubbed bronze Saratoga handset. 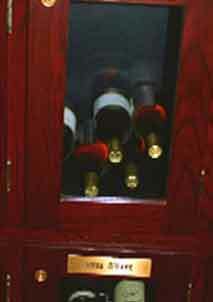 No wine cellar can provide the ideal temperature and humidity for wine storage on its own. They need to have a wine cellar cooling unit installed. An efficient refrigeration unit is one that not only provides the ideal conditions, but is also able to maintain them. Also, each wine cellar has different storage requirements, and it is imperative that you find out what these are so that you can choose the appropriate wine cellar cooling unit for yours. For the under-the-staircase residential custom wine cellar, US Cellar Systems provided an RM2600 ductless split refrigeration system. The cooling unit was placed hanging from the ceiling, with the airflow directed downward. The unit was also placed in wooden housing made from Mahogany, which had a rustic stain and lacquer. 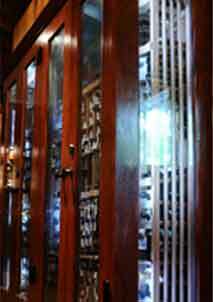 Mahogany was used so that the unit could be concealed to match the wine racking design. Ductless split type refrigeration systems are ideal for small spaces, because they do not occupy a lot of space. This type of cooling system is also a popular choice because it is not noisy.